Learn the skills of the ancient scouts - nature awareness, bird language, and more - in this exciting five day immersion program! 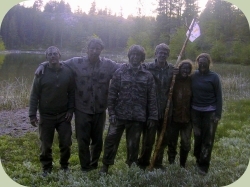 Wilderness scouts played a vital role in hunter-gatherer cultures by traveling afar to locate food and resources, while gathering information on potential dangers. They were considered the "eyes & ears" and protectors of the tribe. Experience how ancient scout skills enhance your connection with nature and understanding of wild animals. Class days are a blend of expert instruction with a variety of hands-on experiential activities. The course is held at the beautiful 160-acre Coyote's Path Wilderness Camp in the foothills of the North Cascades.